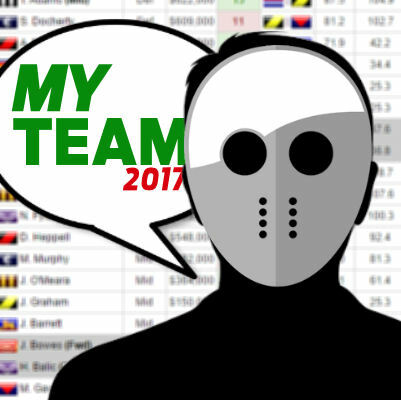 With the JLT underway, we’ll have a new My Team every Sunday night. The JLT Series continues, so here’s a new My Team post starting this Sunday evening. Don’t miss the JLT Notes for week two. Temped to go 2 mid pricers in the ruck as something different structure wise to everyone else, just looking to get more keepers in the mids, and look to priorities getting value throughout the season.. Hmm, risky, and I might be sleep deprived. 3 in my opinion mate. You are asking for help on this, from what I see is that most are telling you to go option 3, a few are option 1 and almost none for option 2. You want a 4th opinion, well it’s 3 for me and I like Pendles as a safe option, but The Magician is the unknown of the 3 and imo the most exciting. 3 for me as well mate, I’d have a look at Steven, Pendles, Titch and Coniglio for that mid spot! Thoughts on Scott Selwood, Jack Steele and Billings? has selwood even played yet? I’d go billings over steele. Draft league due to be held 8pm EDST tonight. Require 4 teams, although others are aware of the code but haven’t joined as yet. First in first served. Any one feel free to join. Keep coming back to this. Yeah, you might have better backmen and a better F1/F5 but tell me this midfield wouldn’t slice you like poop through a goose in round one. $80k in the kitty for round one rooks. Only selection I don’t like is WHE, that’s it, other than that, nothing wrong with that side what so ever! Sooo boys was fiddling with the old DT for a bit, tryna put something a bit more unique together! We all know a few smokies are required to take home that Hilux, would love some thoughts! You’ll be making all the decisions next week on who starts and who doesn’t. 2 teams still required for my AFL Fantasy draft league tonight. 6 teams, 5/6/2/5 / 4 format. All welcome. Get amongst it. Thanks to those who have joined. not sure about caddy. The rest of it looks good. You could upgrade roughy to petracca with that spare coin. In light of my above comment, who has more upside; roughy or petracca? T. Adams, S. Docherty, J. Johannisen. C. Hampton, M. Hibberd, E. Vickers-Willis. P. Dangerfield, T. Rockliff, A. Treloar, T. Mitchell. J. Steven, D. Beams, J. O’Meara, J. Barrett. J. Macrae, L. Dalhaus, I. Heeney. W. Hoskin-Elliott, A. Black, D. Butler. Positive feedback and constructive criticism is appreciated. Good side, but chances of 5 $150k rookies starting R1 are slim. Thinking of going deep in FWDs as good rookies are slim. great looking team mate, think the smartest thing to do is go heavy on the forwards. One of the stronger teams being posted only bad points i can spot is Pickett and Durdin. Pickett may be playing every game this season for the blues but might be better value picks out there. And with Durdin its just job security im worried about, only seen him in one game so far, so just watch carefully. The PROBLEM is I’m 1K! short of this.. it is the type of lineup I’m looking at. Only doubt in this team I have are in the forwards, being Heeney, Steele and WHE. Not sure where I should downgrade and what not, would love to hear of what yous all think, Thoughts!? Touk Miller or Jack Billings in the forward line? ?